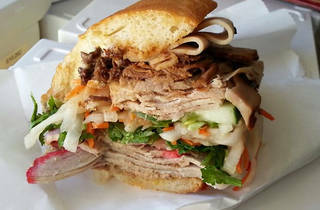 This unassuming deli counter at Duc Loi Market churns out fresh, authentic banh mi in hearty portions. 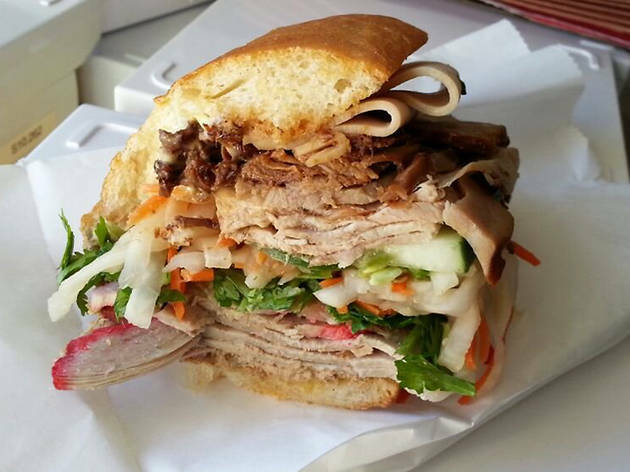 The classic sandwich is stacked with pork pot roast, liverwurst, pork roll, head cheese and pork belly, then topped with daikon, carrot, jalapeño, cilantro and cucumber. Those less meat-friendly should go for the fried chicken banh mi—the chicken breast arrives still hot from the fryer. Lemongrass adds a nice kick to the barbecue pork and barbecue chicken subs, which are moist, messy and addictive. Stock up on house-made spring rolls, kimchi and green papaya salad in the cold case up front.